CONAKRY (Reuters) - The final 68 people who had been in contact with an Ebola patient were released from quarantine on Saturday, said a senior health official, raising hopes of an end to the disease in the last West African country with confirmed cases. The world's worst Ebola epidemic, which hopped borders to kill more than 11,300 people and devastate already fragile West African economies, has already been declared over in Liberia and Sierra Leone. But Guinea, where the outbreak began, has had a more difficult time eradicating the disease. 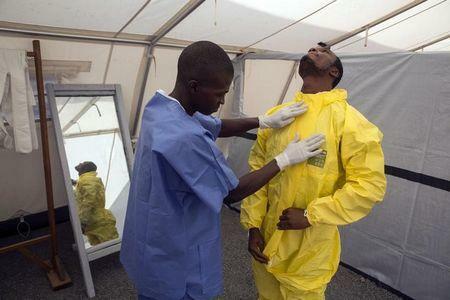 Dr. Abdourahmane Bathily, head of the Ebola centre in Forecariah in western Guinea, said the 68 contacts had emerged from quarantine at midnight on Saturday morning. "There are no longer any people who had contact with a person infected by the Ebola virus," said Bathily. He added that the last confirmed Ebola case was a baby in isolation, who should be released from a treatment centre next week, allowing for the West African nation to begin its own countdown clock. Ebola-affected areas must spend 42 days without a case to be declared free of the hemorrhagic fever, although after cases cropped up after Liberia's first Ebola-free declaration, the World Health Organisation has instituted an additional 90-day surveillance period. More than 3,500 people fell ill and 2,000 people died in Guinea during the outbreak.